Just a quick "Hi!" to let you know I have been busy learning stuff about antennas, which is something I would have never attempted without the awesome tutorials by Alex Greve, or IBCrazy as he is known on the forums. 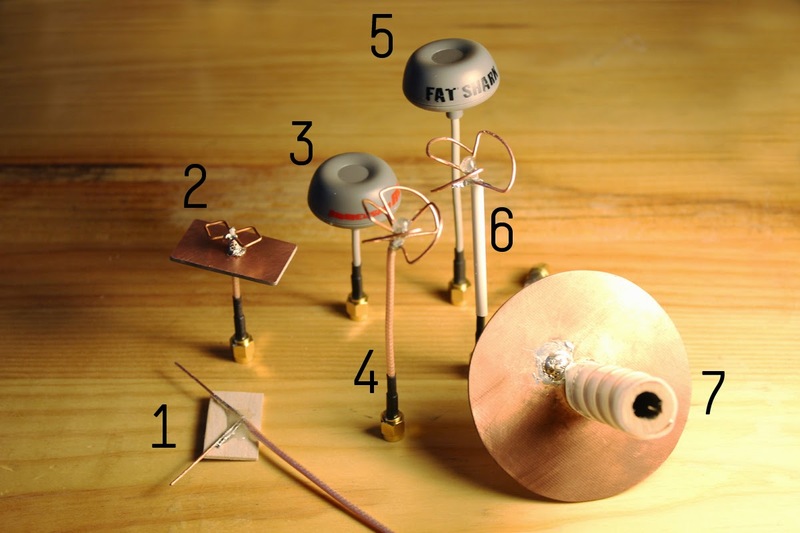 I fly on 5.8GHz, 5705MHz to be precise, and after building myself a diversity receiver, I decided to give home made antennas a go to see what I can get using tailored antennas and combining them. Until a couple of weeks ago I was using my two Spironets (numbers 3 and 5 in the picture above) and they do a decent job, but this hobby without experimenting is like going to the movies and keep your eyes shut, so I decided to go on and build something. 1) Inverted Vee. 3/2 Wavelength vertically polarised antenna, to be used on my wing. 7) Helical. Circularly polarised directional antenna for the ground station. YAY, can't wait for the bloody wind to stop so I can test them out!